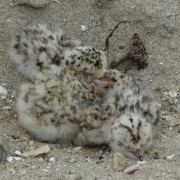 Eyes on the Colony (EOTC), the Least Tern predator monitoring program, needs your help! Last year was not as successful as it could have been with no more than 16 fledglings ever seen at one time out of 120+ chicks. This was primarily due to all the predation by Peregrine falcons and Red-tailed hawks. After battling Great-horned owls and Kestrels the last couple of years, and having a great 2016 year, we are dismayed with last year’s results. We need to document any predation to the terns. Permitting standards require that we thoroughly document and identify avian predators which are taking Least terns before requesting their removal. 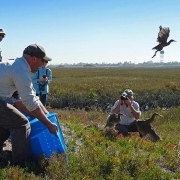 So, the Refuge needs more help observing avian predators at times when they are active. If you can commit to a minimum of 4 hours a week to EOTC, or just want more information, please contact Refuge Manager Rick Nye via email at: Richard_nye@fws.gov. Historically, we watched in four hour shifts from 7:00 a.m. to 7:00 p.m. You must obtain a badge from the Navy to access the Refuge by filling out some background paperwork and must be a U.S. Citizen. Training and equipment is provided. I adore doing EOTC! A car is the best birding blind, and besides watching our wonderful Least terns going back and forth, you get up close looks at Belding’s Savannah sparrows, swallows, and all the other birds and critters that call the Refuge home and/or breed here.